Best used in a high school or college oceanography course. This resource provides a great answer to the question -- what do scientists do? Video includes animation of ocean current circulation and its interaction with the Greenland ice sheet. Comment from expert scientist: The video shows up-to-date information linking dynamics in the North Atlantic Ocean, dynamics in the Greenland ice sheet, seasonal variability, and consequences (sea level rise). It also shows compelling footage and has descriptions of what it takes for scientists to actually obtain relevant data - good personal interest and "process of science" information. 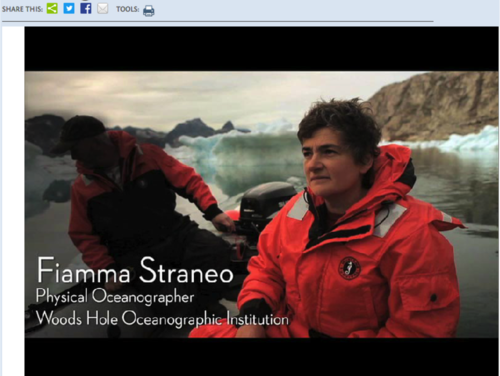 This resource is focused on the work of physical oceanographer, Fiamma Straneo. It provides sufficient scientific context to understanding what she is doing and why. It is not designed to directly stimulate inquiry or the asking of further questions. A good scientist/narrator shows students how science is done and that research is a tough job! The resource includes many stunning images and video. The animation is well-designed. The resource requires the Flash player plugin for web browsers. It may be difficult to project this resource in a classroom. Slow to load in some cases.